Our handwriting tutors specialize in individualized handwriting instruction that results in legible handwriting and increased confidence and self esteem. Our handwriting tutors are passionate about providing individualized services to meet the handwriting needs of our clients. Handwriting tutors at OC Handwriting are certified with the Handwriting Without Tears® program, the only one of its kind in the country. 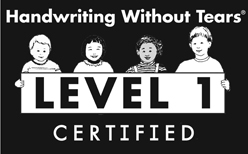 Our highly qualified certified handwriting specialists are occupational therapists, teachers, and educators that have completed extensive training, testing and review of their knowledge and skills. - Barbara Hunter, OTR/L, Ponder, TX. Invest in the future today and schedule a handwriting assessment by calling (714) 875-2474 or by filling out our contact form.